Visually analyze your Google Ads data. Track campaign performance with insightful reports and dashboards. Create, share reports and collaborate with your colleagues on your marketing campaigns. Analyze the effectiveness of your Google Ads campaigns. Find out how your Ad spend is working for you with the Zoho Analytics connector for Google Ads. Perform deeper analysis, gather wider insights and effectively plan your marketing budget for greater conversions. Your data from Google Ads is synced automatically to Zoho Analytics, giving you a full-fledged BI tool to analyze your data in depth. 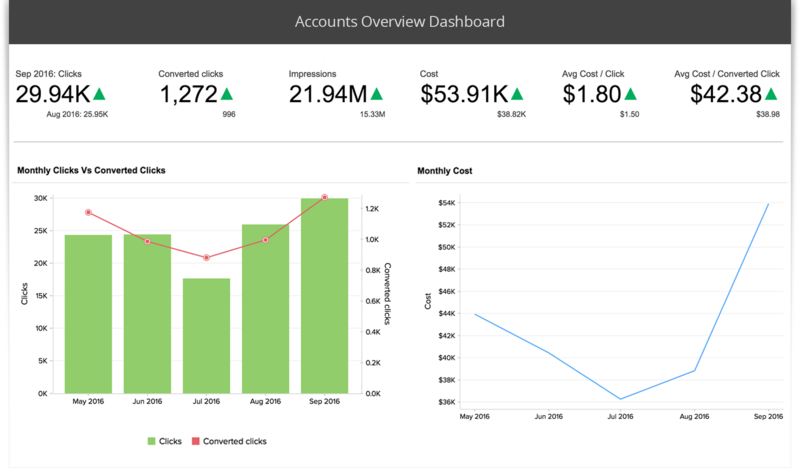 The Zoho Analytics connector provides you with more than 85 hand-picked, ready-made reports and dashboards that you'll instantly find great value in. Visualize and build insightful reports and dashboards with our easy drag-and-drop interface. Use a wide variety of charts, pivot tables, KPI widgets, and tabular view components to build insightful reports and dashboards. Combine data from different sources easily to create cross functional reports. For example, blend your data in Google Ads, Google Analytics and CRM to create a full conversion funnel. Develop and analyze reports together with your colleagues and share them securely with fine-grained access controls. Embed your reports and dashboards across websites, blogs, applications, or intranets for wider consumption. Export and print reports for offline access. Schedule your reports and dashboards to be emailed automatically. "Zoho Analytics is an easy to use business intelligence tool. There are many integration options; we integrate Google Analytics, Zoho CRM, Zoho Projects as well as our custom ERP system. The recommended tables are often useful. Creating custom charts and tables, then organizing them into dashboards is where this software shines."